Flea control services treatments. Your pet may be a member of your family, but sometimes it's easy for them to invite an unwelcomed guest to take up residence in your carpets, couches, and corners, unintentionally causing a big household problem. Flea infestations require multifaceted treatment plans. Addressing only a pet’s infestation or individual flea bites will not prove effective for ridding your home of fleas. Effective flea control should encompass both chemical and physical methods and should be conducted on your pet as well as inside and outside of your home. Contact a pest control professional. Call Pest Control Solutions of Louisiana. ​Our professionally trained technicians will use their science-based approach as they conduct a visual inspection of the likely areas of infestation, including areas where your pets have been. Your technician will take thorough notes of all findings and at the end of the inspection will outline suggestions for implementing an integrated pest management solution specific for your home. Your technician will discuss with you which areas of your home may require preparation before treatment. Fleas are probably most commonly associated with dogs and cats and other pets. However, fleas are more of a problem than just for pets. Fleas can be transmitted to humans quite easily and they bite, looking for a meal of blood. Flea bites cause itching and can make living uncomfortable, plus they are known to carry a variety of diseases. This is just one reason flea control is especially important. What makes fleas so potentially dangerous is that they feed on blood. That means that if they bite an animal that is infected with a bloodborne disease, that can be transmitted to whomever or whatever else they bite. 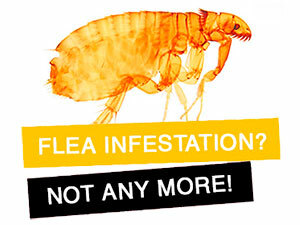 A flea infestation is frustrating because once they get into your home they are very difficult to get rid of. So if you find fleas around your home, your first move should be to call in the professionals who know how to get rid of fleas effectively. Once you've established that your pet is infested with fleas, time is of the essence. But be sure to remain calm and take things one step at a time. First, treat your pet; consult with your veterinarian to find the best treatment option. Secondly, you will need to thoroughly clean and treat your home - inside and out - especially those areas where your pet spends a lot of time. Flea and tick infestations can be difficult to eliminate, so it is a good idea to call your experienced Pest Control Solutions of Louisiana professionally trained pest control experts in order to rid you and your home of fleas. ​First, thoroughly vacuum the entire house, including hard surfaces, with particular attention to any place an animal rested or where animal bedding is situated. Be sure to get under everything - furniture, rugs, etc. Once you are finished, immediately seal your vacuum bag in a plastic bag and throw it away. This prevents the fleas from crawling back out and infesting your home again. Vacuuming and shampooing or steam cleaning the carpet can kill some of the larvae; however it may also still leave some live fleas, so a chemical treatment will probably be necessary.